While Democrats had a tough time with the Midterm Elections, they gained victory with an essential issue that has been advocated for months now. A higher minimum wage was approved by 4 states that tend to lean red in their decisions. South Dakota, Nebraska, Arkansas, and Alaska have all approved state proposals to raise minimum wage over the next few years. 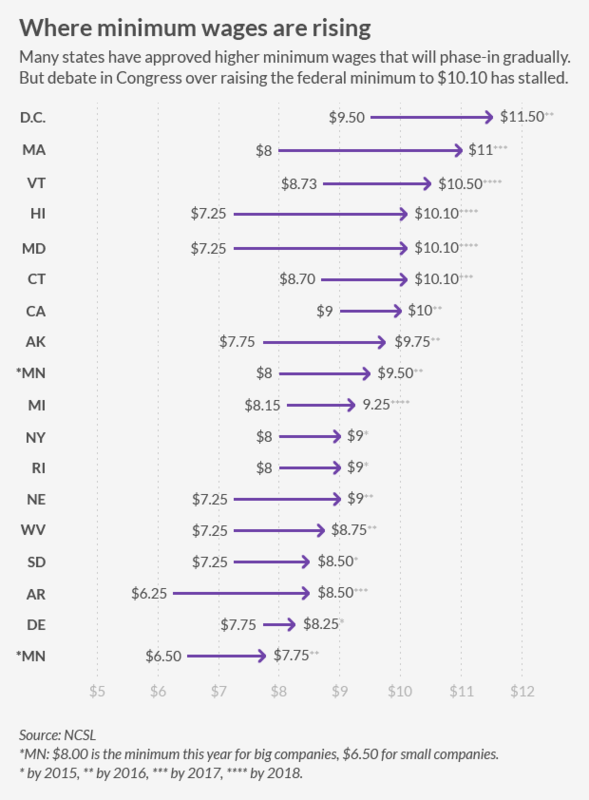 Over the past two years, 12 states and Washington D.C. have all approved proposals to raise their minimum wage. San Francisco seems to be at the front of the pack with their proposed wage increase by 2017: $10.74 to $15 by 2018. The city approved the measure Tuesday night. The image below summarizes where wages are increasing, and by how much.